The best part of having miniature cattle are the new born calves. This could not be possible with out the cows. We really enjoy our cows and always have favorites in the pasture. Not all are pictured but you can see what we are trying to do. Take a look at some of the girls in our herd. We try to keep a wide color variety of cows, including solid colors. 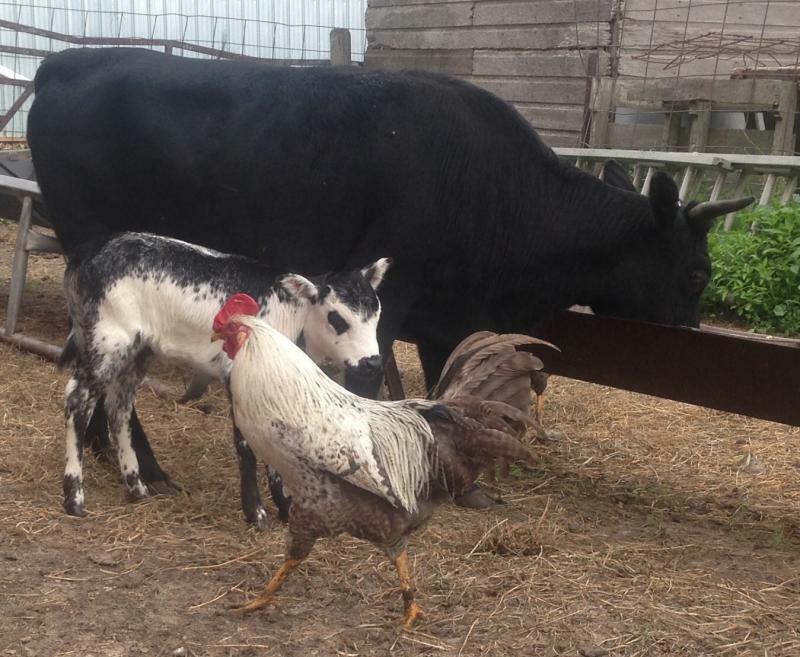 We just like to see calves come out all different colors. We have some cows that have multiple generations of color. I think we could breed these cows to bulls almost any color and get some real flashy calves. 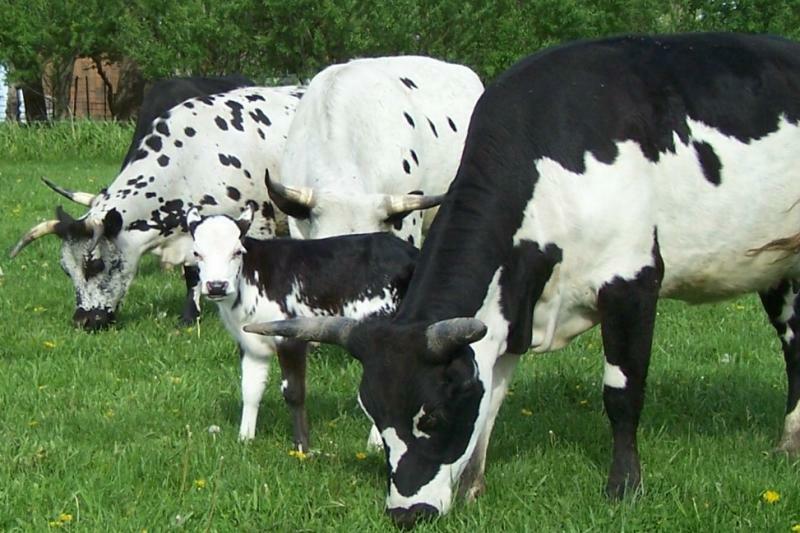 We have been building our cow herd for over 25 years, and it shows in the up in the pasture. Sugar Plum is my favorite cow. She is a 2008 model and has some of the nicest calves on the place. She have 3 daughters, 6 grand-daughters and 2 great grand-daughters and 2 sons, 1 great-grandson in the herd. She is a goldmine for our herd. Bred to Bullfrog for 2019. Sugar Bottom is a 2011 model that bred as a yearling. We have 3 daughters, 1 grand-daughter and 1 grandson out of her line. She is a laid back cow with great calves out of any bull. She has enough color to pass that on to her offspring. Wish I had 10 more cows like her. The first daughter out of Sugar Plum above, she is something. Pictured here as a 3 yr old. Sired by Sugar Cain, she is only 35 inches tall (across the back, at the hips). Bred back to Bullfrog for 2019. Bottoms Up is a 2014 model by Rascal (29inches/180lbs). Her colorful lineback pattern makes her stand out in the pasture. She had a super little heifer we called Monica in 2017. Only 18.5 in/19lbs. This is a strong maternal family line that really shows in our herd. Pictured with her bull calf by Ted in 2018 is a dandy as well. Bred back to B-Dub for 2019. Punkin is a 2015 model out of Sugar Bottom (above) by Hombre. 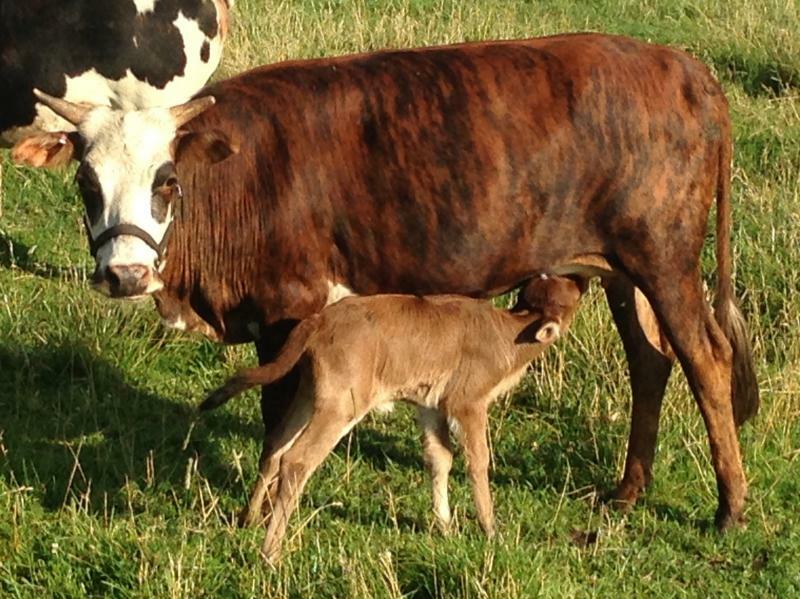 She is an October 2015 model, pictured with her first calf in 2018. 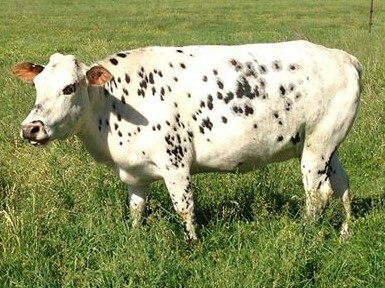 Her flashy color pattern and great personality make her a great addition to the pasture. Can't wait to see what she can do for our herd. She is bred back to Bullfrog for 2019. Sugar N'Spice is a 2012 model that is just as nice as her full sister above (Sugar Bottom). Less spots but her conformation is just as good. She was only 15 lbs when she was born. Pictured here as a 2 year old heifer, we sold her first heifer by Hombre ( a mistake) but have kept her 2016 heifer by Boone (Pearle) She's a dandy. Only to be trumped by her 2017 heifer, Ruby, by Tyson. Bred to Bullfrog for 2019. Talia is a 2016 model first calf heifer. Hard to believe this is only the 3rd daughter out of Sugar Plum. Her sire is Boone. She gave us this super heifer calf in 2018. She will mature under 36 inches and is about as perfect as you can get. She is going to be an awesome cow. Quiet personality, great conformation, super udder. We love this girl. Bred back the same way, with Bullfrog for 2019. Millie is a great cow. A 2009 model, she goes back to Ripley and Freckles. We have kept three of her daughters, one grand-daughter and two grandsons. Her first daughter is Katrina, pictured below. This cow is only 35 inches tall, great conformation and great producer. She is a great producers for our herd. Katrina, a 2012 model out of Millie by Sugar Cain. Pictured here with her 2016 heifer Fergie. She is a super little cow. She bred as a yearling and has had two bulls and two heifers. She will definitely contribute to the herd for many years. She has brindle spots and passed that color on to all her calves. Bred back to Moose for 2019. Glory is a 2013 model and full sister to Katrina. We sold her as a calf and had the opportunity to buy her back. She was dehorned when sold as a calf. She the same great color, disposition and conformation as Katrina. Her first calf is a spitting image of her. Stella was born November 2017. She is bred back to Moose for 2019. Mya is a 2015 model. She is the 3rd daughter out of Millie. She is sired by Hombre, same sire as Punkin. I love her lineback color pattern plus her brindle coloring. We need some more of that. Mya is a great first calf heifer with a nice udder. Her first bull calf is going to be a nice one. Bred back to Bullfrog for 2019. Frostie is a great cow. A 2008 model who has had some great calves for us. 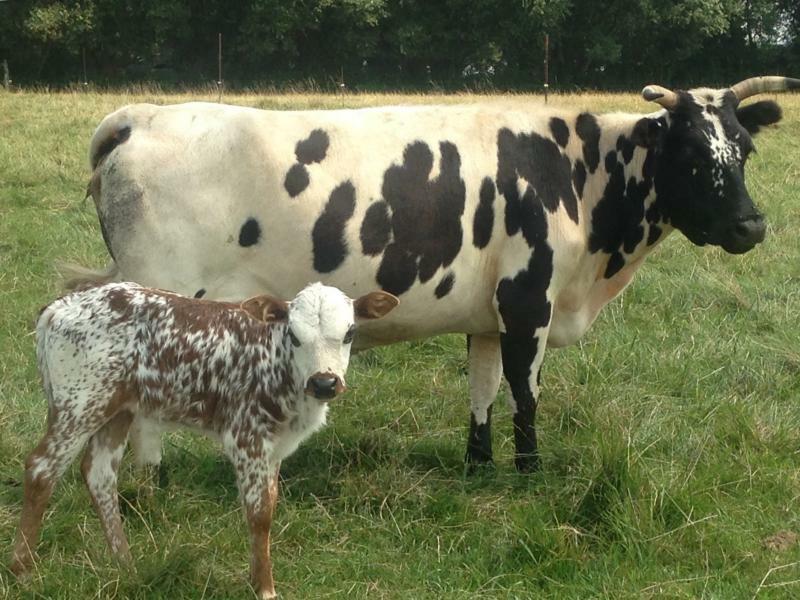 Pictured with her 2013 bull calf. Snookie (below) is her 2010 heifer. Frostie is only 37 inches tall. She will be in the herd for years to come. A great example of what we are trying to do. You could put any bull on this cow and she will give you a keeper. Bred to Bullfrog for 2019. Shelby is a 2011 model that does back to one of our foundation cows we bought in 1997. Her daughter, Penny, is the 5th generation born on our farm. A splash of white really makes her standout in the pasture. 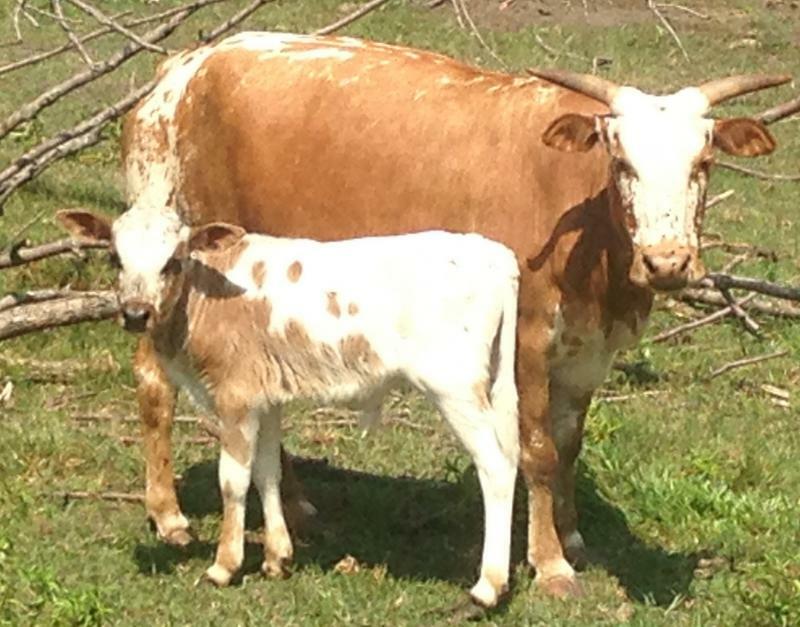 Pictured with her 2018 Hurricane bull calf, she is bred back to Bullfrog for 2019. Sugar, what can I say. I really like this cow. She was born in 2010 and looks better every day. She has red and black speckles and is just a real smooth cow. She has everything that we are looking for in our cow herd. She is a great example of the sizes of our cows. She had an amazing heifer in 2016. Annabelle is the smallest calf we have ever had at 8.4 lbs. 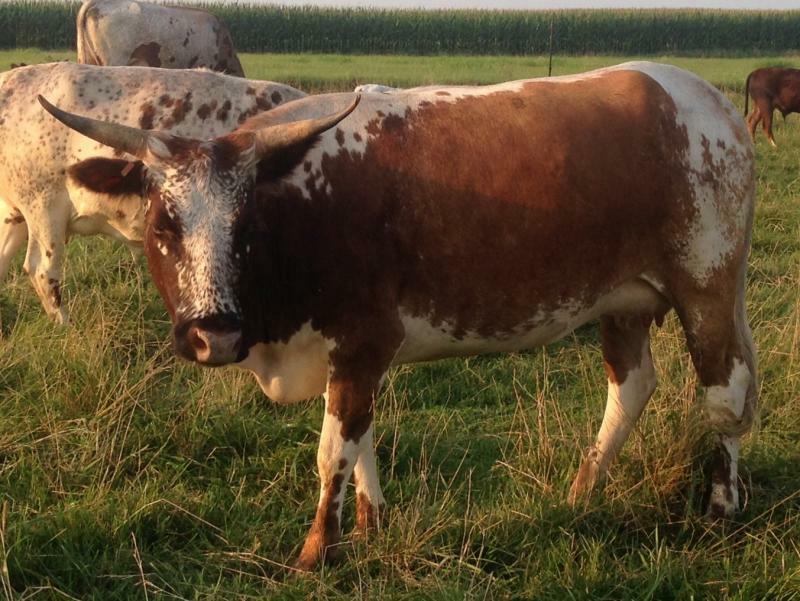 Vee is a nice 2011 cow that is a great grand-daughter to Ripley, one of my favorite bulls. She had three real nice bull calves and we finally got a a nice heifer in 2017, Susie-Q, that we are keeping back. She has a great pesonality and great color that she has passed onto all her calves. She is also one heck of a milker, hopefully she passes that on too. 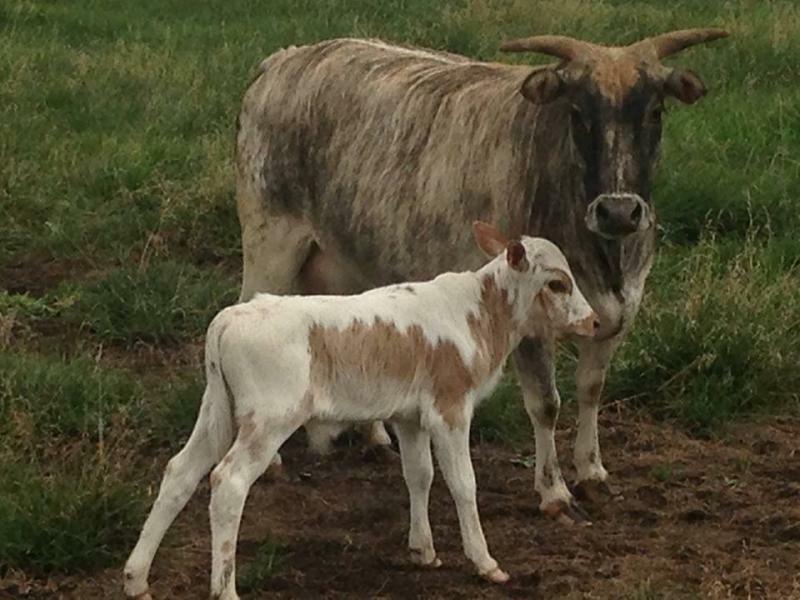 Pictured with her 2014 bull calf Casper. Bred to Hurricane for 2019. Rose, 2014 model pictured here as a 2 yr old is a Vanillie heifer by Sugar Cain. She is a great looking cow. She had a great bull calf in 2017 (Red Handed) and a perfect heifer in 2018. She is a gem in the pasture. She has great color and nearly perfect conformation. Bred to Bullfrog for 2019. KC is a super 2009 cow. She goes back to Bullwinkle and Ripley both. She has matured into a super cow giving us very color and correct calves. She is a great mother. We need to get a few more daughters from her to put back in the herd. She is bred to Hurricane for a 2018 calf. Pitch is a 2011 model. She is 36 inches tall and black as pitch! Not a speck of white on her. All of her calves have been very colorful. She has produce some nice animals for us. She had a real small heifer out of Ted in 2017. Bred back to Ted for 2019. Jo Jo is a nice 2009 cow. She has the loud color we like and only standing about 36 inches tall. She has a quite personality and has had three great heifers so far. She has had 3 great little heifers. She has small and correct calves. We need to keep a couple back. Another producer. Bred to B-dub for 2019. Show Girl, another new cow in 2016. She is a registered standing 36 inches tall. This cow should do it all for us with our bulls. She has the size, color and disposition we like. She came from Vollmer Mini Cattle in Rapid City, South Dakota. She is bred to B-Dub for 2019. Kalamazoo, a 2010 model, is a beautiful blonde. Who doesn't like blondes? She has had 3 bull calves and 3 heifer calves. All in a wide variety of colors and color patterns. She is only about 35 inches tall, long flowing tail and a real nice blonde brindle. Bred to B-Dub for 2019. Pickles, a 2010 model and half-sister to Kalamazoo(above). A nice 36 inch cow that has the brindle we like. 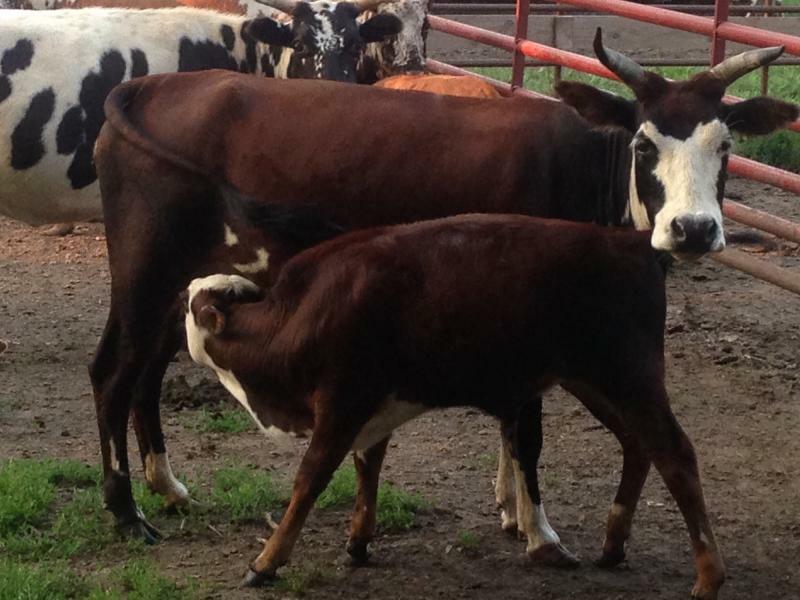 She is a high percentage zebu that has real loud colored calves on the frame we like. She pairs up nicely with our bulls. She can be scratched from head to toe. She is bred to B-Dub for 2019.
Pepper, is one of our smallest cows. She is about 33 inches tall. 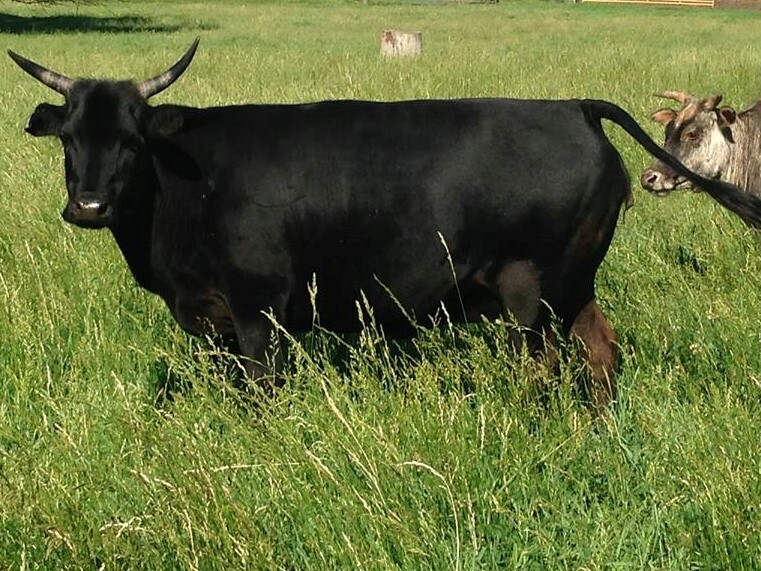 She used her bull calves as breeders and results are awesome. We have some real nice grandkids from this cow.This is a nice, small and colorful cow that has given us nothing but colored calves. Bred to Ted for 2019. Carolina is a great 2012 heifer. She measured only 32 inches on August 2014. She is out of VP, same sire as Minnie and Shelby. He has produce some of our smallest cows. She had a super nice bull calf in 2017 by Tyson. Joel is colored just like her. Bred to Ted for 2019. Minnie is a 2011 model and measures right around 33 inches. She goes back to VP, same sire as Shelby and Carolina. Small and correct in every way.She had a great bull in 2017 by Moose. Maximus has herdsire potential and would take us to the next level (down!) Bred to Bullfrog for 2019. More cows are running on the farm. We have almost all the females pictured here but still missing a few. We have a total of 30 plus females 1 yr old or older. All are nice cows and heifers that have something to offer our breeding program herd.